Nikon has introduced two new rugged Coolpix cameras, including one that features Wi-Fi connectivity. The AW110 features a 16 million pixel back illuminated CMOS sensor, a 5x optical zoom lens and a 3-inch 614k dot OLED monitor. Its tough credentials include waterproofing down to depths of 18 metres, shockproofing from heights of up to 2 metres and freezeproofing for temperatures as low as -10 degrees. Built in Wi-Fi technology means that images can be transferred to a smart phone or tablet for direct uploading to social networks and the like. GPS is available for geotagging of images, while an electronic compass and world map helps to plot a route. An altimeter can also record the exact altitude at which a shot is taken. A hydro-barometer measures underwater depth. Designed for quick use, the Action Control feature means you can adjust camera settings by swinging the camera from side to side - ideal when shooting underwater or wearing thick gloves. High ISO (up to ISO 3200) is available on the AW110, while Best Shot Selector can be used to choose the sharpest of up to 10 sequential shots. Also announced today is the S31, a rugged camera which is designed with families in mind. Featuring a 10 million pixel sensor and 3x optical zoom lens, it is waterproof down to a depth of 5 metres, shockproof from up to 1.2 metres and dustproof. The design of the camera is symmetrical for ease of use. The flash is in the centre, while large, dedicated one-touch buttons can be used for taking a photo or filming a video. Clear menus with bold and colourful icons have been designed to suit all abilities, making it easy to navigate through functions, even for children. Automatic anti-blur technology is included to help achieve sharp shots, while in-camera filters, such as fisheye effect or selective colour are included for extra creativity. 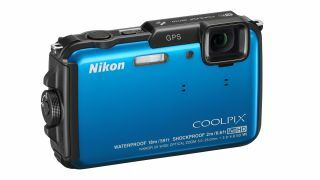 The Nikon Coolpix AW110 price will be £329.99 and it will be available from February. The Nikon Coolpix S31 price will be £99.99, it will also be available from February.